The medieval walls are a different story. Starting with the Angevins in the 14th–century and continuing well into the Spanish and even Bourbon periods in Naples, the protective wall around Naples was constantly under some phase of construction and renewal. That changed in the late 19th– and early 20th–century, during the Risanamento—the great urban renewal of the city. Massive portions of the medieval walls were torn down; some bits were left standing as historical markers, and segments of the wall were simply incorporated into modern buildings. The most obvious historical marker is the part of the wall, fortress and pillars (photo, left) at what used to be the south-east corner of the city wall across from Piazza Mercato and the Church of the Carmine (photo below, left). There is not much left of the fortress, and the ruins you see are often referred to simply as "part of the old wall down by the port". 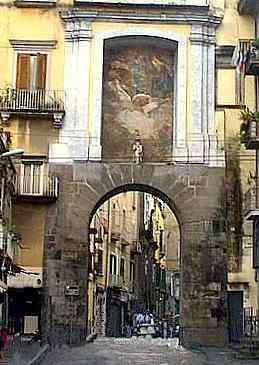 In reality, this is what remains of the Castello del Carmine, now on the main road that runs east along the industrial port of Naples. It was built by the Angevin ruler, Charles III of Durazzo, in the 1380s. It was a true fortress and at the center of battles during the Angevin and subsequent Aragonese period. It was expanded, as well, under the Spanish in the 1560s. It was also one of the strongholds of conspirators during Masaniello's revolt, which led to a very short-lived (5 days!) first "Neapolitan Republic" in 1647. It played a strategic role, as well, in later military campaigns, namely the Neapolitan revolution of 1799 and the Bourbon resistance to the army of Garibaldi in 1860. The pillars seen in the photo are all that remain of the Carmine Gate, one of the main entrances into the city along the south wall in the late Middle Ages. The structure was demolished in the early 20th century to make room for road expansion along the port. These structures (above) may also be called the "Aragonese Towers" because they were modified greatly during that period (see link in paragraph). That was what the TV report called them the other day in commenting on current work to spruce and shore them up in anticipation of somehow working them into a tourist "itinerary" FOR that part of the city. Extra grisly treat for the tourists!—during all the sprucing and shoring, they discovered an entrance long since walled up and sealed. The opened it and found "death row"—where condemned prisoners waited before being walked across the way to Piazza Mercato to be executed. Presumably, this incuded such notabes as Eleonora Fonseca Pimentel and, alas, countless others. Directly across the street is Church of Santa Maria del Carmine (photo, left) at one end of Piazza Mercato (Market Square), one of the most historic sites in Naples. The church itself was founded in the 12th century by Carmelite monks driven from the Holy Land in the Crusades. The historic name of Piazza Mercato is Piazza Moricino. It was the site in 1268 of the execution of Corradino, the last Hohenstaufen pretender to the throne of the kingdom of Naples, at the hands of Charles I of Anjou, thus beginning the important Angevin reign of the kingdom. 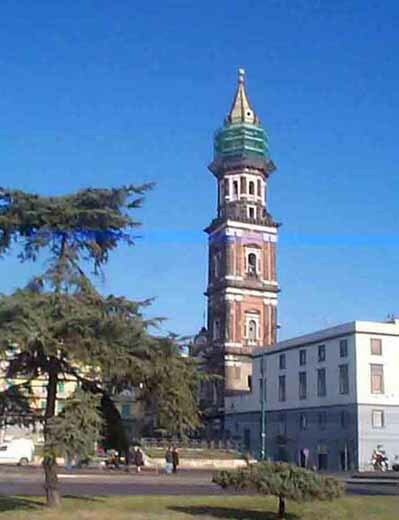 In 1647 the square was also the site of battles between rebels and royal troops during Masaniello's Revolt, and in 1799 the scene of the mass execution of leaders of the Neapolitan Republic. 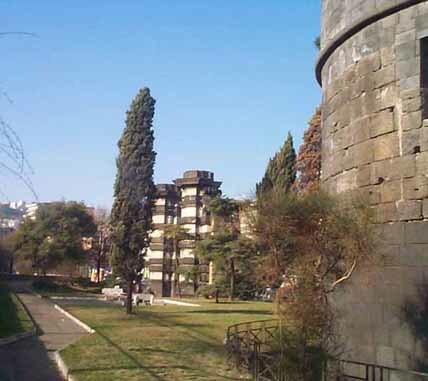 If you walk north into the city from that point along what used to be the line of the eastern wall of the medieval city, you will probably get lost, but, after judicious zigging and zagging, you will eventually come to Porta Capuana and Castel Capuano (photo, right), so-named because this was the point in the city walls where the road led out to the city of Capua. 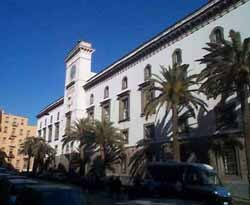 The castle is at the end of via dei Tribunali and housed the Naples Hall of Justice until quite recently (when that facility was moved to the new Centro Direzionale). Castel Capuana was built in the 12th century by William I, the son of Roger the Norman, the first monarch of the Kingdom of Naples. It was expanded by the Holy Roman Emperor, Frederick II of Swabia and became one of his royal palaces. Under the Spanish viceroyship of Don Pedro de Toledo in the 16th century, it became the Hall of Justice, the basements of which served as a prison. Over the entrance to the castle you still see the crest of the Emperor Charles V, who visited Naples in 1535. The castle has undergone many restorations, one as recent as 1860, and thus no longer retains a great deal of its original appearance. Today's Porta Capuana (photo, left), in spite of the name, is not the ancient gateway to the decumanus maximus, the main east-west road that once led out of Roman Naples to Capua. When the city was extended eastwards, the construction of the new Aragonese city walls meant relocating the original gate, which had been closer to the castle. The present gate was built in 1484. It is still there and you can drive or walk through and around it. As you walk west along via Foria, keeping an eye on the dense row of buildings that now stand where the wall used to be, the most obvious thing is that modern office and apartment buildings are not only much higher than the original wall, but that, in the case of one school, as high as what was the acropolis of the original Greek city, itself; the city sloped dramatically upwards in that direction. Piazza Cavour and the Archaeological Museum (down at the far end of the wall before it turned to form another corner and run back towards the sea) are below the highest point in the city, where the Greeks put their acropolis. That height is no longer evident because of the modern buildings in front of the ancient cliff. However, many of the buildings along via Foria have used part of the medieval wall at their base. Why waste a good 100 feet of solid wall? Put in a few windows and doors, and you've got yourself the first few floors of one side of a building. The San Gennaro Gate (photo, left) of course, is in that section of wall and is not only still open, but is still a main pedestrian path in and out of the old city. The medieval western wall of the city—which, itself, followed the line of the ancient Roman wall—was simply knocked down by the Spanish in the 1500s when they decided to expand the city beyond the ancient confines and move up the hill towards the Sant' Elmo Fortress. The long straight road, via Toledo, laid by the Spanish in that period is well outside the ancient city. The Spanish moved Port'Alba, originally one of the main gates in the medieval western wall of the city, a few hundred yards to the west (where it remains today), such that it opened onto the new Spanish section of the city. By that time, the old west wall no longer served any defensive purpose and much of it went the way of all old walls in Naples—torn down, ploughed under, built over, and, in some cases, reincarnated as parts of newer buildings.